It's a new day! You sit down in front of your computer, bursting with ideas and motivation to get things done. You start off by checking email--and before you know it, lunchtime has arrived, and all you've done is watch cat videos and read fascinating Wikipedia articles. To overcome this problem, you can try avoiding email or using a distraction blocker. But you have another option: TimeSnapper Professional, a $25 utility, records periodic screenshots of your work and lets you play your day back like a fast-forward video, so you can see exactly where your time went and change your habits. TimeSnapper lets you play your day back like a fast-forward video, and shows you reports about your computer use. People say that hindsight is 20/20, and when it comes to TimeSnapper, that seems true enough. Playing back your day makes many activities seem far less important and far less rewarding: The cat videos are not as funny, and you suddenly find yourself wondering, "Why did I waste all of that time?" Through this utility, you can watch yourself procrastinating to the point where it becomes an escalating emergency. The next day, YouTube might not seem like such a harmless diversion. Another advantage of playing back your day with TimeSnapper is that it allows you to determine exactly how long a task or project took. For example, you may discover that a boring chore did not stretch as long as you thought it did: You just interrupted it to do something more interesting when you were midway through, and came back to it later. Then again, you might also realize how much time you spend doing things you dislike, and come up with ways to do them faster. Since TimeSnapper can save full-resolution screenshots of your entire screen every 10 seconds, it can even serve as a backup of sorts: If you accidentally delete a document that you were working on, you could use TimeSnapper's screenshots to see what you wrote and maybe even restore the text using an OCR program. That isn't TimeSnapper's intended use, but you can never have too many backups. TimeSnapper saves screenshots as individual files that you can see in any image viewer (my test shots worked very well with IrfanView), but it also has a built-in player with some interesting options. The player shows your day as a color-coded timeline in which red means "time-waster" and green means "productive activity," according to a list of productive applications that you configure. The granularity is fantastic: You can see exactly what you were doing at any moment of your day, so you never have any questions as to where your time went. Screenshots can take up a lot of space, but TimeSnapper can automatically purge its history every few days (14 by default), or as soon as the shots exceed a maximum size (5GB by default). The most important caveat about using TimeSnapper is that you must keep the screenshots in a secure location. In the wrong hands, they represent a treasure trove of personal information about yourself and your browsing habits, not to mention any passwords that might have briefly displayed in plain text (for example, within KeePass). You can have TimeSnapper encrypt the screenshots using a simple password, and you can pause recording when certain applications are active, but you shouldn't count on that. Just keep those files secure. TimeSnapper lets me audit my day and learn how I really use the computer (as opposed to how I think I use it). I find that willpower beats automated filters, and TimeSnapper helps me bolster my determination to get things done and not waste time. As long as you're the only one using your computer, TimeSnapper is beautifully simple and effective. 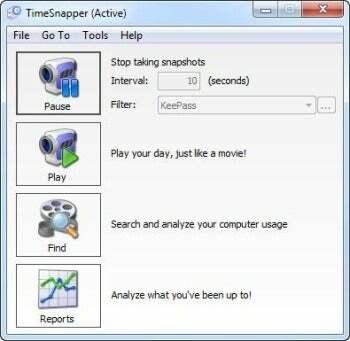 With TimeSnapper you can record your computer use and play it back to evaluate your productivity.